"Hurling matches were played in olden times between two townlands or two parishes. Every available man in each parish took part. The ball was thrown up at a point between the two parishes. There was a referee and no foul play. The winning team carried the ball home to a fixed point. It was all cross-country play. There were no sidelines and no half-time. The hurleys were different from those of to-day. The handle was straight and there was a knob instead of a boss. The ball was much heavier than it is now. Some of them were leather covered but the majority of them were covered with horse-hair twisted into a thread almost as thick as copying-pencil. The ball was closely sewn with this. This heavy ball was called a “roan·shuck”. A ball was made from a suitable brier root for practice. It was called a “bow-rick". The townland or parish challenge matches were called “conquering matches”. A “conquering match" to be held between the parishes of Freemount and Liscarroll was proclaimed by the Freemount priest. He advised his parishioners to stay at home as there was to be a lot of blood shed that day. The ball was to be thrown up at Mullane’s fort Ballybahallow. That was about eight years ago. Men, women, and children came from Liscarroll, but Freemount stayed at home, The priest’s name was Fr.Cosgrave. When the ball got into close play it was called "scuaibin", and many heads were broken". Hurling and Gaelic Football were played in Kilbrin in the last century. Records exist of a Kilbrin team which took part in a tournament in Dromtarriffe in 1892. It is believed that there was a football team in Curraghs around 1925. Jim, Matt and Toby Bluitt, Martin and Paddy O’Brien, Tim and Michael O’Sullivan, Dinny, John and Tim Mullane, and Jack Murphy were all members of this team. Hurling was played in a field - owned by Con Cronin, Castlemagner - opposite Mullane’s forge in the 1940s. A team was formed and went under the name of Curraghs Rovers. Players included Denny Fitz, Jim Buckley, Dan Buckley, Mick Brislane, Jerry O’Connor, Paddy Regan, Tim Mullane, Ben Mullane, Denny Mullane, Jack Mullane, Jim Fitz, Donal O’Brien, Tim O’Mahony, Dan O’Mahony, Dave Field, Paddy Field, Joe Field and Jack Murphy. They played several challenge matches, but never affiliated to any board. The team went out of existence, although many of the players continued to puck around in the same field now owned by Denis Kearney. In conjunction with the opening of the Dr.Croke Hall in 1952, a game was played between Na Piarsaigh and Castlemagner, in the field which was later to become our present playing pitch, Fr.Kelleher Park. No official team represented Kilbrin until the Kilbrin club was formed in 1953. A meeting was called, and the first committee to be elected were:- Chairman, Dan O’Mahony; Secretary, Patsy Corkery; Treasurer, Dan Buckley. Despite being anxious at the time that the establishment of a club should be postponed for a couple of years, to allow time for the debt on the Dr.Croke Hall to be cleared, Fr.Donie Ryan was to take a very active part in the club as President, and he refereed many tournament games. The team trained in what is now Ned English’s field opposite the “Slate Houses”. 1954 was the first year that Kilbrin took part in a Duhallow Board competition. They competed in the Junior hurling league of that year and defeated Newmarket while losing all other outings. The following year proved to be a very different story. Having, played very consistently during the entire league campaign, they qualified for the final against Millstreet. The game was played in Bolsters field in Kanturk, and Kilbrin were given very little chance of success against a very experienced and successful Millstreet fifteen. Having played with a strong breeze in the first half, Kilbrin built up a good lead and were very much in the driving seat by half time. Many Kilbrin supporters felt that the lead would not be adequate against the experience of Millstreet. However, the youth and enthusiasm of the locals prevailed and they held out, winning by seven points on the score of 4-2 to 1-4. This was a great achievement for Kilbrin and many of those who played at that time felt that if the training and management of the present day prevailed at that time, many more trophies would have been won. This team had three sets of brothers in its ranks, namely The Duanes of Clash, The Dennehys of Coolmahane and The O’Sullivans of Corbally. In 1956 great things were expected from our hurlers. The team again qualified for the league final, this time against Kanturk. The memory of this league final will live long in the memory of those who played in it, and also those who were fortunate to witness it. It took three epic games to decide the issue, and finally, the laurels went to Kanturk by the narrowest of margins. Many of those who played for Kilbrin in those games still feel that victory should have been theirs, because two of Kilbrin’s most influential players, namely Dermot Curtis and Dermot Curtin, were injured and unable to play on the third day. Kilbrin were also on the loosing end in the league final of 1957. They had to give best to a much more experienced and sharper Castlemagner outfit. Kilbrin’s fortunes declined after that and they found it very difficult to field a team, through lack of numbers, right up to 1962. However, in 1963, Kilbrin competed at Novice level and qualified for the final against Meelin. Having beaten Meelin in a previous round of the league, Kilbrin fancied their chances. However, the arrival of Fr.Finbarr Kelleher to Meelin put paid to that. An injury to both Pat Duane and Mick O’Mahony early in the game also contributed to Kilbrin’s downfall. Kilbrin had to wait another year before a hurling trophy would come to the little village again. In 1964 Kilbrin qualified for the final of the Novice hurling championship to be faced on this occasion by Knocknagree. The team was led by Mick O’Mahony and ran out convincing winners on the score 2-6 - 0-0. In 1957, Kilbrin won the novice football championship, beating Dromtarriffe in the final, which was played in Bolsters field in Kanturk, on December 23rd. Weather conditions were appalling at the time and the pitch was a sea of mud. Goals from Pat Dennehy and Denis O’Donoghue (penalty) swung the issue in favour of the locals. Kilbrin were beaten in the final the previous year in the same competition by Lyre. Kilbrin played Junior Football after the '57 victory, but with very little success. The club struggled during the late fifties and early sixties from a hurling point of view. However, the under-21 side, which had merged with Castlemanger, won the Duhallow Championship in 1968. After a great and sporting contest Kilbrin defeated Meelin on the score of 2-8 - 2-7. The winning team was as follows:- M.Heffernan (Kilbrin), D.Dinan (K), T.Barry (Castlemagner), M.Buckley (C), F.Sheahan (K), M.Dennehy (K), N.Meade (C), J .Moylan (K), D.Daly (C), L.O’Mahony (K), M.Nagle (C), D.J.O’Callaghan (C), T.O’Riordan (K), N.O’Sullivan (K) and B.O’Callaghan (K). During the 50’s many junior hurling tournaments were held by the local club and played on Noel Corkery’ s field (behind Wayne King' s house). Great contests were witnessed and attendances were on par with Duhallow Championship games. Many teams from Avondhu took part in those toumaments and the standard of hurling was very high and Kilbrin proved the victors in one such competition. Kilbrin continued to compete in the Junior Hurling competitions without success in 1970 and 1971. Afterwards, the team disintegrated, and by 1973, former players had either given up the game or had started playing with other clubs. In 1974, Fr.Finbarr Kelleher was appointed curate in Kilbrin. Fr.Finbarr had a long love for the G.A.A., especially hurling. His arrival heralded a new beginning for the club. The club was revitalised under his leadership. It was not long before a panel of players was available, and the blue and white, colours of Kilbrin, took their place in the playing fields of Duhallow again. The team trained in a field generously provided by John O’Riordan. In the beginning, Kilbrin played Junior “B" hurling and football. Success was to come immediately, as in 1975 Kilbrin won the Junior “B" hurling league and championship. The 1975 team was captained by John Field. In 1976 the team got the permission of the Duhallow Board to compete in the J.H.L. This was to help the club greatly because it meant better quality games. Against all the odds the club was to reach the J.H.L. final only to be beaten by Newmarket. This was a great achievement by a Junior (B) team. In the same year Kilbrin retained the J . (B) H.C., under the captaincy of Michael Duggan. By 1977, the Kilbrin hurling team had upgraded to Junior level. Again this year the club showed great commitment and reached the League Semi-Final only to lose to Dromtariffe, and lost after a great game in the championship to Meelin. By 1978 the Kilbrin club was well established with teams being affiliated in hurling and football in all grades. A thriving juvenile club was also present. 1978 was to be a year when history would be made by the club. After a long league campaign Kilbrin again reached the play-off stages of the league. Kilbrin met Dromtariffe in the semi-final, and beat them comprehensively, in Newmarket. Kilbrin’s opponents in the final were Meelin and after a great game Kilbrin took the cup. After this victory the club went on the championship campaign with great hope. This hope was to turn to joy when the team won its first junior championship. Kilbrin beat Banteer in the first round, Newmarket in the semi final, and beat Tullylease, 4-14 to 1-8, in the final. The history-making team was as follows:- J.Aherne; M.Sheahan; Ml.Duggan; Ml. O'Mahony (Ban); D.O’Sullivan (Captain); Ml.Dennehy; J.Moylan; P.Field; D.O’Mahony; J.O’Mahony; N.O'Sullivan; T.Field; T.O’Riordan; D.Kelleher; L.O’Mahony. Subs:- P.O’Reilly; F.Sheahan; B.Cashman; S.O’Riordan; J .O’Reily; J .Lynch. The team trainer was Dan Kelleher, brother of Fr.Kelleher, The selectors were Fr.Kelleher, Jack Field and Sean McAuliffe. After the historic victory in Duhallow, Kilbrin went on the county trail for the first time. Kilbrin lost to the eventual county champions, Mayfield, on a score of` 2-17 to 1-8, in a game played in Coachford. In 1979, Kilbrin was to continue where they left off in 1978. Kilbrin again reached the league semi-final, where they beat Kanturk (5-16 to 3-6). The opponents in the final were again Meelin, and again a great game took place. After 60 minutes of great hurling Kilbrin retained their title on a score of 4-8 to 4-7. The team was:- J.Aherne; P.O’Reilly, M.Duggan, M.O’Mahony, D.O’Sullivan, M.Dennehy, J.Moylan D.O’Mahony, P.Field, J.O’Mahony, N.O’Sullivan, L.O’Mahony, T.O’Riordan, M.Sheahan, B.Cashman. The team captain was Pat Field. In 1979, Kilbrin’s first round opponents were Lismire. In a game played in Newmarket, Kilbrin easily won. This game was overshadowed by the tragic death of John O’Callaghan (Lismire), shortly after playing. In the next round, Kilbrin were paired against Meelin. Only a point had separated the teams in the league final, and a close contest was expected in this game, but Kilbrin surprisingly won easily, on the score 3-13 to 2-6. After this game Kilbrin were favourites for the championship, but this was not to be, as Newmarket beat Kilbrin in a semi-final played in Kanturk. Following Kilbrin’s great end to the 70’s, great things were expected in the 80’s, but on the contrary, the 80’s were to begin in controversial circumstances. Following an incident packed J .H.L. semi-final v Tullylease in Newmarket, the Kilbrin club and the Duhallow board had a disagreement, which resulted in Kilbrin opting out of the J .H.L. final (v Meelin) and subsequently being eliminated from the Junior Hurling Championship. Back in 1976, a piece of land was bought from local man, Con Cronin, with the aim of giving Kilbrin its own pitch. 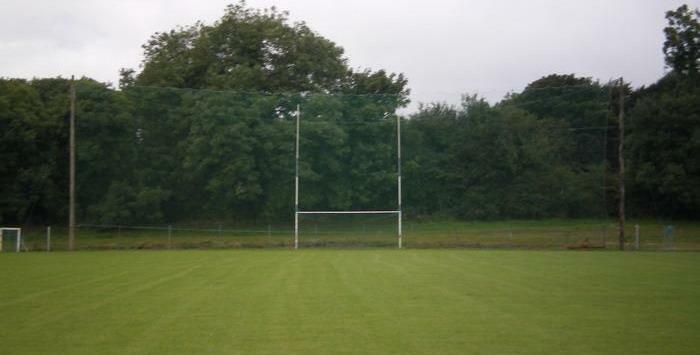 After years of work and development this pitch was finally ready and was officially opened on 24/5/1981 by Paddy O’Driscoll, Chairman of the Cork County Board. The game which marked the opening was a senior football challenge, Cork -v- Kerry. The game ended in a draw and after ten minutes extra time the scores were still level Cork 0-6 Kerry 0-6. Kerry won the toumament on the toss of a coin. Both _teams had famous players on their teams. Cork had players like Kevin Kehilly, John Evans, the late Tom Creedon, Conor Couninan, and Declan Barron while Kerry had Ger O’Keeffe, Ger Lynch, Tom Spillane and John Egan on their team. On the local scene, Kilbrin were back in search of honours again. They again qualified for the play off stages of the J .H.L., but this game was postponed to the end of the year, to let the championship start. In the J.H.C., Kilbrin had a 1st round victory over Lismire on the score 4-13 to 2-7 and, therefore, qualified to meet Meelin in the semi-final. This game was to be a talking point for many a year. Meelin won on the score 3-12 to 4-8, but the remarkable thing was that Kilbrin led at half-time by 16 points! Kilbrin also qualified for the J. (B) Football semi-final, only to lose to Boherbue (0-7 to 1-7). The league semi-final was held over until late in the year, and in this Kilbrin beat Tullylease 1-10 to 1-8, but had to give best to Meelin in the final, on a score of 1-12 to 0-6. Kilbrin took part in the Singleton Cup for the first time in 1981, and was to be successful in this competition. In the semi-final, Kilbrin beat Banteer, 3-13 to 1-3, and in a very close final, Kilbrin, under the captaincy of Donie O’Mahony, got the better of Newmarket (1-6 to 0-8). The team was as follows:- J.Ahern, M.Sheahan, P.O’Reilly, P.Breen, J.Moylan, M.Dennehy, B.Cashman, D.O’Sullivan, M.Duggan, D.Sheahan, N.O’Sullivan, S.O’Reilly, T.O’Riordan, D.O’Mah0ny, S.Murphy. Subs:- P.Field, T.Field, J.O’Sullivan, B.Noonan, J.O’Reilly, T.O’Reilly, T.Lenihan. 1982 again began in good fashion for the Kilbrin club. They reached the J.H.L. semi-final, only to lose to Tullylease at Kilbrin, on the score of Tullylease 0-10 Kilbrin 1-5. The J.(B)F. team were also beginning to make their mark and reached the knockout stages of the league. In the quarter final they beat Knocknagree, 0-7 to 0-4, but had to give best to Boherbue in the semi-final, on the score Boherbue 1-3 Kilbrin 0-4. Back on the hurling championship trail, Kilbrin beat Newmarket, 3-7 to 1-9, to earn them a tilt at Banteer in the semi-final. Again in this game, Kilbrin were successful (3-9 to 1-12), and so reached the Duhallow final for a second time. Not to be out-done, the Kilbrin J. (B) H. team were also doing well, and when they beat Freemount, 3-7 to 3-3, they also qualified for a Duhallow final place, against Lismire. So on the last weekend of August, an unique achievement was to take place, with the Kilbrin J.(B)H. and J.H. teams playing their finals on the same weekend. On the Friday night, the J. (B) team had a convincing win over Lismire . The score was 3-8 to 1-6. The team was:- L.O’Mahony, J.Power, J.Moylan, M.O’Mahony, L.Buckley, T.O’Reilly, P.Kiely, J.J. Breen, N.O’Reilly, B.Noonan, J.Sheahan, J.O’Donoghue, J.Lynch, J.McAulif’fe, M.Cronin. Subs:- S.Fitzgerald, D.O’Mahony, J.O’Reilly, D.O’Connor, T.O’Mahony, N.O’Sullivan, J.McCarthy. Having this victory under their belt, Kilbrin went to Kanturk on the following Sunday with great hope in their final against Meelin, but alas on the day, Kilbrin had to give best to Meelin on the score Meelin 1-13 Kilbrin 1-6. Team:- J.Ahern, M.Sheahan, P.O’Reilly, M.Duggan, D.O’Sullivan, M.Dennehy, B.Cashman, S.Murphy, D.Sheahan, T.Field, N.O’Sullivan, T.O’Riordan, S.O’Reilly, P.Field, F.Sheahan. Subs:- J.O’Reilly, L.O’Mahony, D.Kelleher, L.Buckley, J.Lynch, J.Sheahan, D.O’Connor, P.Breen, T.O’Reilly. After this disappointment, Kilbrin went on the Singleton Cup trail, to see if they could retain this cup. Having reached the Duhallow final, the team was reasonably fit, and as a result beat Banteer, 5-11 to 1-4, in the first round, and beat Kanturk, 4-13 to 3-2, in the semi-final. Kilbrin now had qualified for the final, and in a match played in early Decemeber, beat Freemount 2-5 to 2-3 to retain the cup. Team:- J.Ahern, M.Duggan, P.O’Reilly, B.Cashman, T.O’Reilly, M.Dennehy, D.O’Sullivan, S.Murphy, D.Sheahan, T.Field, M.Sheahan, P.Field, S.O’Reilly, F.Sheahan, J .O’Reilly, D.O’Connor, L.Buckley, J .O’Sullivan. The beginning of 1983 began, like the previous years, in good fashion again for the club. In the junior hurling league, the team was to win all its games bar one, but unfortunately this one loss was to put the team out of contention, because of an inferior scoring average. The J.(B)F. team were also going well, and easily qualified for the league quarter-final, which would be played later in the year. In the first round of the J.H.C., Kilbrin were drawn against Tullylease. In an ill-tempered game, played at Kilbrin, the game was abandoned with ten minutes remaining. A fortnight later, both teams were back at the same venue where this time Kilbrin made sure of victory on the score 2-15 to 0-7. The next game was against Dromtariffe, and here again, Kilbrin won convincibly (2-9 to 0-2). This victory put Kilbrin in the semi-final against Kanturk, a team they had not met in the championship for seventeen years. After a slow start, Kilbrin were to be successful, on the score Kilbrin 1-12 Kanturk 0- 9. For the second year in a row, Kilbrin were in the Duhallow final, this time theiropponents were to be Lismire. In a game played at Kanturk, Kilbrin were again slow to start and after a poor first half performance, in which they played with the wind, Kilbrin were to loose on the score Lismire 2-11 Kilbrin 1-11. Team:- J.Ahern, S.O’Reilly, P.O’Reilly, M.Duggan, D.O’Sullivan (Captain), J.O’Callaghan, B.Cashman, S.Murphy, J .O’Reilly, P.Field, D.Sheahan, T.Field, T.O’Riordan, M.Sheahan, P.Breen. Subs:- L.O’Mahony, D.Kelleher, N.O’Sullivan, J.O’Sullivan, F.Sheahan, D.O’Conmor, J.Lynch, M.Dennehy, J .Sheahan, T.O’Reilly. Before the J .H.C. final, the J .(B)F. team had beaten Ballydemsond 3-9 to 0-7, in the quarter-final of the league, and after the defeat in the hurling final it was left to this team to bring a cup to Kilbrin. This team was not to disappoint. In the semi-final Kilbrin beat Glenlara 3-10 to 2-3, and in the final, played in Boherbue, Kilbrin beat Millstreet, on the score 1-5 to 0-5. The first football cup was to come to Kilbrin after many a year. Team:- J.Sheahan, T.O’Reilly, M.Duggan, N.O’Sullivan, S.O’Reilly, B.Cashman, P.Breen, J.J. Breen, N.O’Reilly, D.O’Sullivan, M.Sheahan, D.Sheahan, J .O’Sullivan, T.O’Riordan, J .O’Reilly. Subs:- J.Power, D.O’Connor. 1984 was the centenary year of the G.A.A., and considering that Kilbrin was the birthplace of its first patron, Dr.Croke, it was only fitting that the centenary should be celebrated there. To honour the occasion, the Duhallow Board decided to have its annual convention there on 22-1-1984. Later in the year, a special mass of thanksgiving was celebrated in the church with the chief celebrant being Most.Rev.Dr.Thomas Morris, Archbishop of Cashel and Emly, assisted by the Bishop of Cloyne, Most Rev.John Ahern. After the Mass, a plaque in honour of Dr.Croke was unveiled in the church grounds by Mr.Paddy Buggy, President of the G.A.A. Also that year, a special open air concert was held in the G.A.A. grounds, with such groups as the Dublin City Ramblers, Jim McCann, Jimmy Crowley taking part. To honour the occasion, the Munster Council staged the J.H.C. Munster Final in Kilbrin, between Cork and Tipperary. In a close game Cork won 0-14 to 0-10. On the local scene, Kilbrin were to put in a big effort to get honour that year, and by the end of the year four cups would be in the village. The first of these was the Junior Hurling League Cup. In the semi-final, Kilbrin beat Lismire in a high-scoring game, Kilbrin 4-14 Lismire 5-10. In the final at Freemount, after a close battle with Meelin, Kilbrin won on the score Kilbrin 3-9 Meelin 3-7. Team:- J.Aherne, T.O’Reilly, P.O’Reilly, M.Duggan, D.O’Sullivan, J.O’Callaghan, B.Cashman, J.J.Breen, P.Field, S.Murphy, J .Sheahan, S.Sheahan, S.O’Reilly, M.Sheahan, F.Sheahan. Subs:- L.O’Mahony, D.O’Mahony, J.O’Sullivan, J.J. O’Donoghue, J.Lynch, P.Breen, L.Buckley, D.O’Connor, T.O’Riordan, J .Power, N.O’Sullivan, M.Dennehy. In the J.H.C., Kilbrin had an easy victory in the first round, Kilbrin 7-9 Millstreet 2-3, but Lismire were to beat Kilbrin in the semi—final, 2-13 to 2-9. In football, Kilbrin also reached the knock-out stages of the league, only to lose after a replay to Glenlara 4-4 to 1-11. This loss was a great disappointment, as this competition was a county one. However, in the J.(B)F. Championship, Kilbrin, with victories over Kiskeam 3-11 to 1-2, Lismire 2-14 to 0-1, Freemount 1-3 to 0-3, reached the semi-final of the Championship, where they beat Knockscovane, 2-12 to 0-3, and so qualified to meet Dromtariffe in the final. In a game played at Banteer, the teams finished level 0-5 each, but in the replay, played in Knocknagree, Kilbrin were to win; Kilbrin 2-2 Dromtariffe 0-6. Team:- J.Sheahan, T.O’Reilly, S.O’Reilly, P.O’Reilly, M.Duggan, B.Cashman, L.Buckley, N.O’Reilly, J .J . Breen, J .J . O’Donoghue, D.Sheahan, J .O’Reilly, M.Sheahan, T.O’Riordan, D.O’Sullivan. Subs:- J .O’Sullivan, J .Power, N.O’Sullivan, J.Lynch, A.Field, D.O’Connor. Back on the hurling front, the U-21 hurlers were to win the title for the first time since 1968, with victories over Meelin, 2-6 to 3-1 and Lismire, 1-9 to 2-4. Team:- S.Fitzgerald, M.O’Donoghue, J.Power, J.McCarthy, T.Cronin, J.J. O’Donoghue, A.Field, D.Sheahan, M.Cronin, T.Noonan, Ds.O’Connor, G.Noonan, D.O’Brien, G.Barrett, P.Kiely, M.Cussen. The final cup to be won in 1984 was the Singleton Cup with victories over Newmarket 3-15 to 1-2 and Kanturk 4-13 to 4-8 in a replay and Meelin in the final 5-6 to 2-4. In 1984 Kilbrin also lost two finals in the J. (B) H.C. and the U-21(B)F.
In 1985 Kilbrin would continue on their winning ways, but this time it would be the football squad that would bring glory to the club. Kilbrin football team would play 16 competitive games and lose none of them. In the county qualifying league Kilbrin easily got to the semi-final where they defeated Glenlara 2-3 to 0-6. This victory put Kilbrin in the final against Knockscovane. In a game played at Newmarket, Kilbrin had eight points to spare at the end of the match Kilbrin 1-13 Knockscovane 1- 5. For the first time Kilbrin were on the County football trail and great excitement engulfed the parish. In the first game at Donoughmore Kilbrin beat Ballygarvan 0-9 to 0-5. In the semi-final Kilbrin’s opponents were St.C0lm's. This game was played in Ballyvourney. Many people regard thisas the best game Kilbrin played in 1985 and when the final whistle blew Kilbrin led 0-9 to 0-7. The following Sunday the final was fixed for Mallow with Kilbrin’s opponents being Kilworth. This game turned out to be a very close contest. Kilbrin were the better team but a host of missed opportunities especially in the second half left Kilworth with a chance to the end. Kilbrin were fortunate in the end when Kilworth missed a scoreable free. Great scenes of jubilation were witnessed when Maurice Sheahan (Captain) received the cup from Con Murphy, County Board Chariman. Team:- J.Sheahan, M.Duggan,P.O’Reilly, N.O’Sullivan, J.J. O’Donoghue, B.Cashman, D.O’Mahony, J .J.Breen, N.O’Reilly, J .O’Reilly, M.Sheahan (Capt) D.Sheahan, J .O’Callaghan, P.Breen, D.O’Sullivan. Subs:- M.Cronin, J.O’Sullivan, T.O’Reilly, A.Field Ds O’Connor, T.Noonan, J.Lynch, Liam Buckley. Selectors:- F.Sheahan, Ml.Dennehy, D.Breen. In the Duhallow J. (B) F.C., Kilbrin were still only at the semi-final stage but with a victory over Freemount 2-11 to 0-7, they qualified to meet Kiskeam where they were victorious 0-8 to 1-2. In the 1985 hurling competitions, Kilbrin lost to Meelin in the first round of the Championship 3-16 to 1-14. The same opponents beat Kilbrin in the J .H.L. final 1-12 to 1-3. Kilbrin also lost the U21 (B) F final that year to Freemount. In 1986 Kilbrin again qualified for the league play offs. In the semi final Kilbrin beat Kanturk 2-13 to 3-7 in a game played in Freemount. The final of this competition was not played until 1987. In the J .H.C. Kilbrin beat Lismire (who won the competition for the previous three years) in the first round 0-14 to 1-9. Kilbrin’s opponents in the semi-final were again Kanturk. In a very close game at Newmarket Kilbrin won 2-13 to 2-12 and so qualified for their fourth final. In the final Kilbrin ran into a very inform Meelin and lost convincingly 3-21 to 2-11. Team:- J .Aherne, D.O’Mahony, J .O’Callaghan, M.Duggan, J.J. O’Donoghue, T.Cronin, B.Cashman, D.Sheahan, J.Sheahan, D.O’Sullivan, M.Sheahan, M.Cr0nin, S.O’Reilly, P.Breen, F.Sheahan. Subs:- G.Noonan, S.Fitzgerald, M.O’Donoghue, L.Buckley, J.O’Sullivan, J.J. Breen, S.Butler, J .McCarthy, B.Barrett. In 1986 the football team upgraded to the Junior competition. After doing well in the Examiner Cup the team raised a few eyebrows when they beat Millstreet in the first round of the championship 1-6 to 0-8, and in the next round drew with Ballydesmond 0-6 to 0-6, before losing the replay 1-10 to 1-7. 1987 was to be a bad year for Kilbrin on the playing fields. Firstly Kilbrin had to play Meelin in the 1986 league final. After beginning very well, Kilbrin had to give best to Meelin in the end, on the score 4-13 to 4-7. In the 1987 league Kilbrin reached the semi final only to lose to Lismire 1-13 to 2-6 in a game played in Kanturk. In the J .H.C. Kilbrin were to go out in the first round, losing to Newmarket 5-4 to 2-8. In football Kilbrin were finding the going tough in the Junior grade, failing to qualify in the Examiner cup, before losing the first round of the championship to Dromtariffe 0-11 to 1-7.
in a draw 1-11 to 1-11. This was to be the first draw in a Duhallow final since the competition was begun. In the replay Freemount were to be victorious on the score 1-11 to 1-7. This was a game which was going Kilbrin’s way to half time, but a poor second half performance gave the title to Freemount. Team:- J.Aherne, B.Barrett, P,O’Reilly, J.O’Callaghan, M.O’Donoghue, J .J. O’Donoghue, B.Cashman, J.O’Reilly, T.Cronin, J.Sheahan, D.Sheahan, D.O’Sullivan, D.O’Mahony, S.O’Reilly, B.Aherne. Subs:- P.Breen, T.O’Reilly, G.Noonan, J.O’Sullivan, D.Brosnan, S.Fitzgerald, J.McCarthy, M.Hayes, T.O’Riordan. In the Junior Football the story was to continue the same as the year before and Kilbrin went out to Kanturk in the championship 4-7 to 2-5. Kilbrin also contested the J(B) H.L final in 1988 only to lose to Castlemagner. In regard to 1989, the saying that “its a long road that has no turning" was very true. Kilbrin having lost the four previous finals that they played in (including one replay) were finally to become Duhallow Champions again. The year started only fairly for Kilbrin and they did not qualify for league play off. However, the team under new coach Johnny Keane (Liscarroll) prepared well and in the first round had a great win over Meelin 2-16 to 3-6. In the semi-final, Kilbrin beat Lismire (3-12 to 2-8) and so qualified for their fifth final. This final was to be unique for many reasons. Firstly, Kilbrin opponents were to be Banteer, who would contest their first final in 32 years. It also was to be the first final to be played in Lismire. Finally, Kilbrin would have on their team a father and son in Jer. Aherne and Brian Aherne who would be the first father and son combination to figure on a winning team. On the day in question, a good first half performance would win the day for Kilbrin, and by half-time, Kilbrin led by eight points. A late goal by Brian Aherne left Kilbrin winning by 1-13 to 1-6 There were great scenes of jubilation when Dan O’Sullivan received the Duhallow Cup, for the second time, in Lismire that evening. Kilbrin then went on the county trail and how near they came to reaching a county final. In the first round at Castletownroche, Kilbrin beat Na Piarsaigh 4-10 to 2-8. This game was a very tough game and Kilbrin gave one of their best displays to defeat the city champions. In the semi-final played at Kanturk, Kilbrin had to give best to Clyda Rovers 2-8 to 0-10. This was a game that Kilbrin had in their grasp when they led by two points with ten minutes remaining, but Clyda finished well and got a vital goal with five minutes left. Team:- J.Ahern, B.Barrett, P.O’Reilly,J.O’Callaghan,M.O’Donoghue, D.Sheahan, B.Cashman, J .O’Reilly,S.Butler, P.Field, J .J . O’Donoghue, D.Q'Sullivan, J .Sheahan, S.O’Reilly, B.Aherne. Subs:- D.O’Mahony, P.Breen, G.Noonan, C.O’Sullivan, D.Brosnan, T.O’Reilly, J.O’Sullivan, V.Hayes, J .McCarthy, W.Heffernan. The selctors were Ml.Duggan, J .Lucey, Ml.Dennehy. In the J .F.C. of 1989, Kilbrin were to lose to Knocknagree, 1-14 to 1-8. After the great year in 1989, a lot was expected again in 1990, but Kilbrin were not to get any trophy that year. In the J.H.L., Kilbrin were beaten in the quarter-final by Lismire 4-11 to 4-8. In the championship, Kilbrin beat Newmarket 3-10 to 3-4 in the first round, but on a very warm day in Newmarket, Kilbrin surrendered its title to Meelin 2-15 to 0-9. The J.(B)H. team kept the flag flying, only to lose in the final to Tullylease, 4-16 to 1-7. Kilbrin’s best performance in 1990, came in the football field. In the first round, Kilbrin were complete outsiders against Kiskeam, but against all odds, Kilbrin won 0-11 to 0-6. Kilbrin were to go out in the quarter-final when they were beaten by Dromtariffe 2-9 to 0-10. In 1991, Kilbrin were again back on the winning ways and reached the league semi-final only to lose to Banteer 5-9 to 2-12. In the Championship, Kilbrin again had an easy victory over Newmarket 5-19 to 1-9, only to find Banteer their bogey in the semi-final, where Kilbrin lost 1-10 to 2-5. In the J.F.C., Kanturk were to prove too good for Kilbrin, on the score 4-12 to 0-12. Later in the year Kilbrin were to get some consolation, when they won the Singleton Cup for the fourth time with victories over Castlemagner, 4-17 to 2-8, and Freemount, 1-11 to 0-5, in the final. In 1992, Kilbrin started very poorly, but as the year went on, the team improved, and by the end of the year Kilbrin would have got its second league and championship double in hurling. In the league, Kilbrin just qualified for the semi-final, claiming the last qualifying place. In the semi-final, Kilbrin beat Banteer 4-10 to 2-11 and in the final played in Banteer Kilbrin beat Meelin 1-13 to 0-13. In the championship Kilbrin easily beat Castlemagner in the first round 6-10 to 3-6 before they beat Freemount in the semi final 2-16 to 3-6. In the final Kilbrin’s opponents would be Banteer in a repeat of 1989 final. This was a game in which Kilbrin got off to a great start and led at half time by 14 V points. Banteer fought back gamely in the second half but by the final whistle Kilbrin lead by 2-14 to 2-11. Team:- J.Aherne, P.O’Reilly, S.O’Reilly, B.Barrett, M.O’Donoghue, D.Sheahan, T.Cronin, S.Butler, J .O’Reilly, P.Field, J .Sheahan, J .J .O’Donoghue, D.O’Sullivan, M.Sheahan, J .O’Callaghan. Subs:- I.O’Sullivan, B.Cashman, V.Hayes, D.Breen, J .O’Sullivan, Dermot O’Sullivan, N.Corkery, T. McMahon, E.Casey, F.Casey, B. Aherne. Selectors:- Ml.Dennehy, D.Kearney, Ml.Duggan. Coach:- Johnny Keane (Liscarroll). In the county, Kilbrin faced Glen Rovers. The first game ended in a draw, Glen Rovers 0-10 Kilbrin 1-7, but in the replay Kilbrin lost 2-11 to 0-10. In 1992 Kilbrin had regraded to J(B) Football and reached the league semi-final only to lose to Freemount after a replay 1-9 to 0-11. In the J(B) F.C Kilbrin had wins over Cullen, 1-16 to 0-5, Glenlara 1-6 to 1-4, and Millstreet, 1-10 to 0-5, before losing finally to Lyre, 1-9 to 0-8. Since the arrival of Fr.Kelleher in 1974, and up to the present day, great attention has been devoted to under age level. Many successes have been achieved, the most notable being the reaching of the County final at under-14 level in 1992. The amalgamation of Kilbrin and Castlemagner as Croke Rovers at under age level has been a great success. This was the only alternative, as either club on their own would not have been able to field an underage team. If the young players of the parish can be nurtured, the prospects for the future of Kilbrin G.A.A. club look very bright indeed. Great credit is due to the people who train and look after these under age teams. This parish is very fortunate to have as its schoolmaster, Mr.Sean O’Gorman outstanding Cork player at the moment, a man who has won every honour with his County. It must surely be an inspiration to his pupils to have such a man not only as their Master in the classroom but also in the playing field. Kilbrin’s successes were not only on the playing fields. In the G.A.A. talent competition, which is called Scór, Kilbrin were also successful. Since the beginning of this competition, Kilbrin took part at both Juvenile and Adult Level. The successes at both Juvenile and Adult in the local Duhallow competition were numerous. At Scor, Kilbrin were also to win County Honours. In 1989 the Juvenile quiz team of Michael O’Riordan, Denis Duggan and Bob O'Donoghue would win the County and reach the Munster Final. At adult level the club would also get County Honours in set dancing and solo singing. The set dancers were crowned champions on two occasions, in 1989 and in 1993. Those who took part in these years were Liam Buckley, John Buckley, John Lynch, Jim Buckley, Dermot O’Sullivan, Kathleen O’Sullivan, Julia Buckley, Catherine O’Sullivan and Kathleen Buckley, under the watchful eye of Mary "Niall” O’Sullivan. In solo singing, Nora Mary O’Riordan won the County final in 1992. With the excellent facilities that are now in Kilbrin, there is very little reason why hurling and football should not continue to flourish, and without doubt, more Duhallow and County Titles will come our way in the not too distant future, and the blue and white of Kilbrin will continue to be worn with pride on the backs of our sportsmen. Presidents - Fr. Donie Ryan, Pat Corkery, Christy Hannon, Tom Kearney, Fr. Patrick Mumane and Dan O’Mahony. Chairmen — Dan O’Mahony, Tim Goulding, James Neenan, Fr. Finbarr Kelleher, Michael Dennehy and Pat O’Reilly. Secretaries - Patsy Corkery, Pat Fitzgerald, Denis O’Riordan, Pat Duane, Donal O’Mahony, Tim Dennehy, Michael O’Mahony, Sean McAuliffe, Liam Buckley and Dan O’Sullivan. Treasurers - Dan Buckley, Michael O’Mahony, J.J.O’Donoghue, Jack Field, Michael Dennehy, Dan O’Sullivan, Michael Duggan, Tim Cronin, Bill Cashman and Brendan Barrett. Dan Buckley, Pat Duane, Pat Dennehy, J.J.O’Donoghue, Michael Dennehy, Dan O’Sullivan.